Giuseppe Stanziale first appears in at Painesville, Lake County, Ohio, in 1926. He probably came to northeast Ohio from Columbus, Ohio, at the same time as his brother, Antonio Stanziale. In America, Giuseppe Stanziale was known Joseph A. Stanziale. 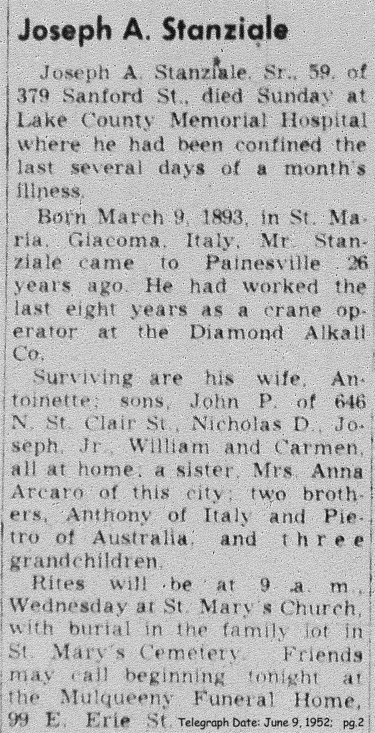 Giuseppe Stanziale, son of Emilio Stanziale and Nicoletta Ruberto, was born on Thursday, March 9, 1893, at Santa Maria Giacoma, Italy. Giuseppe married Antonia Ruberto about 1920 at Italy. Giuseppe died on June 8, 1952, at Lake County Memorial Hospital, Painesville, Lake County, Ohio, at age 59, of heart disease. His body was interred at Saint Mary Cemetery at Painesville Township, Lake County, Ohio. Giuseppe Stanziale first immigrated to the United States on March 14, 1910, at age 17. He was travelling to Ashtablula, Ashtabula County, Ohio, to join his cousin, Antonio Marano. Giuseppe Stanziale registered for the World War I Draft on June 5, 1917. He was living at 58 Second Street, Ashtabula, Ohio. Giuseppe is cited on a passenger ship manifest re-entering the United States on September 8, 1922, at age 29, travelling to Ashtabula, Ohio. He was joining his uncle, Domenico Stanziale, in Ashtabula. Giuseppe had returned to Italy in 1918, after World War One. He was living at Columbus, Ohio, in 1923 when his brother Antonio returned to the United States. Mr. Stanziale became a citizen of the United States in 1929. Giuseppe resided at 597 St. Clair Street, Painesville, Lake County, Ohio, when he was naturalized. At the time of death, Giuseppe resided at 379 Sanford Street, Painesville, Lake County, Ohio. Giuseppe worked for the Diamond Alkali Company from 1944 until his death. 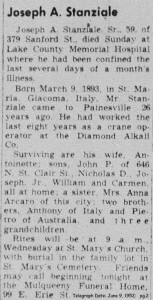 Giuseppe Stanziale was one of five Stanziale siblings who lived in Painesville: Nicola Stanziale arrived in Painesville in 1905, Giovanni Stanziale immigrated to Painesville in 1906, Antonio Stanziale migrated to Painesville in 1926. His sister, Anna Maria arrived in Painesville in 1928. 1. Giovanni Stanziale was born on Sunday, March 25, 1923, at Cantaluppo del Sannio, Italy. Giovanni married Lena E. Lucrezi, daughter of Marco Lucrezi and Antonia DePaulis. Giovanni died on February 26, 1996, at his home, Painesville, Lake County, Ohio, at age 72. His body was interred at Riverside Cemetery at Painesville, Lake County, Ohio. 2. Nicholas D. Stanziale was born on Sunday, September 20, 1931, at Painesville, Lake County, Ohio. Nicholas married Mary Jane Carraher, daughter of Milan Carraher and Inez Ross, about 1952. After the death of his first wife in 2004, Nicholas married second, Grace Klebe on May 26, 2007. Nicholas died on June 29, 2013, at his home, Madison, Lake County, Ohio, at age 81. His body was interred at Perry Cemetery at Perry, Lake County, Ohio. 3. Mary Y. Stanziale was born on Monday, June 19, 1933, at Painesville, Lake County, Ohio. Mary died on December 16, 1933, at 379 Sanford Street, Painesville, Lake County, Ohio, from bronchial pneumonia. Her body was interred at Saint Mary Cemetery at Painesville Township, Lake County, Ohio. 4. Joseph A. Stanziale Jr. was born on Sunday November 18, 1934, at Painesville, Lake County, Ohio. Joseph died on December 2, 2008, at Richmond Heights, Cuyahoga County, Ohio, at age 74. His body was interred at Ohio Western Reserve National Cemetery at Rittman, Ohio. 5. Emilio Stanziale was born about 1937, at Ohio. 6. Carmen Stanziale was born in May, 1939, at Ohio.